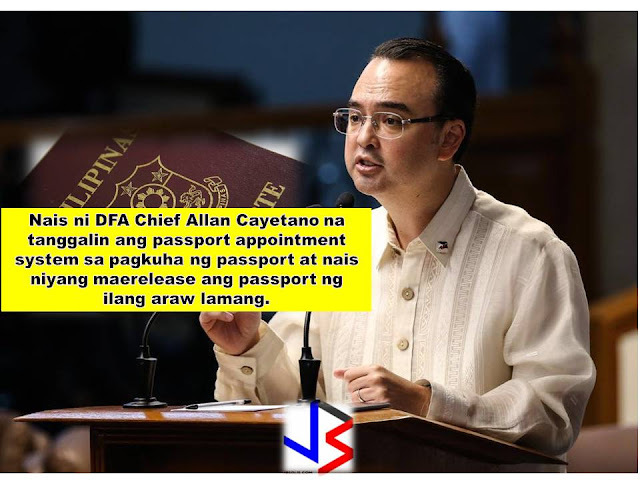 The new Department of Foreign Affairs Chief, Allan Cayetano made a speech after the flag raising ceremony at DFA. He mentioned during his speech that President Rodrigo Duterte asked to make the welfare, protection and convenience of OFWs a priority. One of the issues that has to be addressed in relation to this is the passport application system. During his speech, he mentioned that he spoke with Asec. Frank to work with his transition team and work with people responsible with the passporting system. He said, he is expecting from the day he gets back from Russia that the memo will be on his desk determining what could be done to speed up the process of passport application and remove appointment system. He added, the goal is to be able to walk-in and apply for passport, then get the passport in few days, or later on apply for passport in the post office just like in the United States. To accomplish this goal, according to him, we might be needing more machine, mobile passport program or employees. He said, if funds are not yet available and if additional employees will be needed, they could use his salary so that it could be implemented to started right away. Last weekend, he visited the DFA in surprise. He witnessed during his visit the long queue of passport applicants, some taking more than five hours to process their passport. There is also a big problem with system where applicants have to take appointment to apply for passport. One applicant said, there is almost two months wait to get appointment for passport application.